Queues in hospitals grow due to, among others, the increasing world population and delay in patient attendance. One way of solving this problem is developing systems to provide treatment directly in the homes of patients. These systems help to decrease queues, improving the attendance to those looking for assistance. In this chapter, the authors present an ontological representation of knowledge of homecare environments and the modeling of an architecture for pervasive systems to this kind of domain. Systems with this modeling aim to improve services provided by professionals during treatment of patients located in their houses. 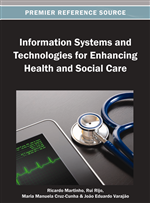 The authors used concepts of pervasive computing to provide access to information anytime and wherever the user is, once a homecare environment has a high level of dynamicity. The knowledge representation is done through ontologies due to the possibility of reuse of information stored, as well as the interoperability of information among different computational devices. One of the main problems faced nowadays by administrators of hospitals is to offer a quality service to their clients. Every year, the queues in hospitals grow due to a set of factors like, for example, high demand of patients, problems of infrastructure, poor internal communication and lack of professional commitment, which compromises the clinical treatment of patients (Andrade, et al., 2009). One way to minimize the delay on the costumer service is to invert the way the patient is treated today. Instead of the patient goes to the hospital to receive the treatment, the clinical services go to the patient’s house through the implantation of medical applications. A homecare environment is characterized by the possibility of the patient to receive medical care directly in his house, whether by necessity like in cases where the patient is unable to move, or even by his own will, once he will stay more time with the family and friends. A homecare environment may become very dynamic, once the patient can live and enter in it wherever he wants, walk through the rooms or receive visit of relatives and friends. Besides being at home, the patient should be monitored constantly, and any sudden worsening on his health state should be treated immediately. This way, a system with medical applications to homecare should support these frequent changes in the context of the environment. In this scenario, pervasive computing appears as a solution to solve problems like mobility and dynamicity that characterize a homecare environment. Pervasive computing allows access to information anytime and anywhere and, thus, can provide quick and secure access to the medical record of patients to clinicians through applications even if they are not in their workplaces (Chen, 2004). They can take faster decisions about which treatment apply to a specific patient whose health is worse. To develop these kinds of applications we need a system that could use information from the context of the homecare environment. For this, a detailed representation of the knowledge existing in the domain is needed. One of the more appropriate ways to make this representation is with ontologies. They can be defined as a formal representation of a contextualization. An ontology is composed by entities and relations defined formally and with a detailed semantics. If these relations have names that identify their meanings, a human will be able to understand it as well as a software could assume a semantic of a relation and act through it (Gruber, 1993). Ontologies ensure interoperability of environmental information that travels through the system so that they are correctly interpreted without ambiguity, independently of the platform of processing of the devices. Using concepts of pervasive computing and ontologies, this paper has three main purposes connected each other. First, we intend to find a way to assist the health professionals in their daily tasks. With this, the workflow of the clinical treatment of the patients will be improved. With these two goals achieved, the last, which refers to the improvement of the attendance of patients in their houses also will be achieved. To do that, we present an ontology that represents the existing knowledge in homecare environments and also a methodology for an architecture for pervasive systems with medical applications. The ontology could be used by pervasive systems developed from this architecture aiming to assist professionals during the treatment of patients. These systems ensure a constant communication between the patient's house and the clinic that is offering the service. Thus, if a patient suddenly worsens, the system communicates immediately the professional on duty in the house of the patient, and also warns the hospital (or clinic) if a specialized backup is needed. This is possible because the homecare environment will have sensors monitoring the patient and sending information about his health state to the system. Another problem solved with applications developed to homecare environments is the overcrowding of hospitals. Once exists the possibility of the patient to receive the treatment at home, with the same quality of the hospital, the queues tend to decrease considerably, and consequently, the patients that still decide to receive treatment in hospitals will receive a better attendance. Finally, with this methodology we intend to improve the workflow of treatment of patients in their houses through the suggestion of possible next steps that professional might want to take during their routines.